Metro Orlando once again is the most dangerous place in the country to take a walk, followed closely by three other Florida regions: Tampa-St. Petersburg, Jacksonville and Miami-Fort Lauderdale. 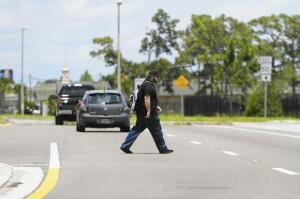 Wide roads designed to speed traffic and far-flung subdivisions served by strip centers have combined in Orlando and much of Florida to make crossing the street a risky proposition that can end in death, according to a report released Tuesday by a coalition of nonprofits that studied pedestrian-fatality rates in the nation’s largest metropolitan areas. Florida Highway Patrol Sgt. Kim Montes said Colonial Drive, along with State Road 436 and U.S. Highway 441, or Orange Blossom Trail, are the most perilous roads in Metro Orlando. All have sections of six lanes or more, fast traffic and lots of pedestrians trying to cross. In most accidents in which a walker is hurt or killed, Montes said, the pedestrian is to blame because he was darting across traffic and not in a crosswalk with the traffic light in his favor. Orlando also was ranked No. 1 for putting pedestrians in peril in 2011 — when the first Dangerous By Design report was released. Amy Fusco of east Orange County learned the hard way about how difficult it is to cross a major street in Orlando when her 17-year-old son, Von, was almost killed by a car on Colonial Drive near Rouse Road in 2012. Von had just gotten off a Lynx bus with another boy and decided to cut over right there, instead of going a few dozen yards up the road to the traffic light and a crosswalk. Both boys were struck, with Von suffering severe head injuries, along with numerous broken bones. The other boy was hurt, but not nearly as badly as Von. Although her son should have used the crosswalk, Amy Fusco contends the road is too wide, the speed too high and the space between crosswalks too far. “It was just an all-around accident,” said Fusco, who still cannot drive where the accident occurred because of the bad memories. Von, now 19, had to relearn how to walk and talk. He is now taking computer classes at Valencia College. In 2012, Metro Orlando leaders created a program called Best Foot Forward. The goal was to get drivers to yield to pedestrians in crosswalks and reduce injuries and deaths by 50 percent within five years in Orange County and Orlando. Thanks to increased enforcement of traffic laws, officials say drivers now yield 48 percent of the time to pedestrians in crosswalks on roads with speed limits of 35 mph or less. Pedestrian deaths in Orange County dropped from 38 in 2012 to 36 last year in Orange County, according to a release from Best Foot Forward. “Florida and Central Florida have a long way to go to improve the safety for all road uses, but at least we’re pushing the safety needle forward,” said Amanda Day, project director for Best Foot Forward. Orlando got its top ranking based on a survey of the top 50 major markets that considered how often people walk in a community, compared against the number of pedestrian deaths. Orlando and the four-county region of Orange, Seminole, Osceola and Lake recorded 583 pedestrian deaths from 2003-12, according the report. And from 2008-12, the annual number of pedestrian deaths per 100,000 people was 2.75, despite the fact that a small proportion of residents walk to work, at just 1.1 percent. Montes said Orlando streets will only get safer if motorists look out for pedestrians and walkers stay out of traffic.